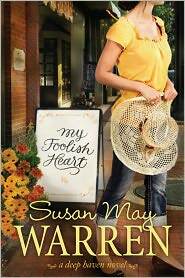 My Foolish Heart by Susan May Warren is a cute romance novel about trusting that God's perfect love expels all fear. Isadora Presley is, unknown to her small town of Deep Haven, the star of My Foolish Heart, a popular talk radio show. From her home studio she gives her listeners advice on romance... even though she's never had a date. A tragic accident took her mother's life and since then panic attacks have gripped Issy's life. Consistently reminding her listeners that the perfect love may be next door, it can't be true for her. When a handsome new neighbor with an unruly dog moves in next door Issy's not so sure her perfect love is the boy next door. She believes that love, just isn't work the risk. But when she starts to have feelings for a caller- a man that she's never laid eyes on, she starts to change her mind. Because he's honest, charming, sensitive... a man that she doesn't realize lives right next door. I really enjoyed this book. Perhaps because I see a little of myself in Issy, perhaps because the book takes place in my home state of Minnesota. It was sweet, well written, and includes wonderful messages on love, forgiveness, and God's grace. This is a book that I would recommend to others. Susan May Warren has written other Deep Haven novels but I didn't feel that I had missed out on anything. The book also comes with group discussion questions. Tyndale has provided me with a complimentary copy of the book for review purposes. this looks cute! i've heard her books are great!